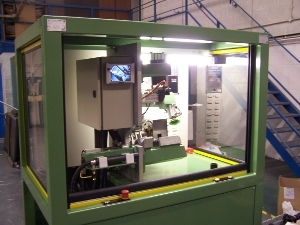 This machine assembles two rubber hoses onto a blow moulded turbo charger duct and torque fastens them with clinch clips. Next, pressure is introduced to the vessel to leak test the component. An infra-red camera is then released from its nest and aligned with the duct so that the passageway can be visually inspected to be clear of obstacles. 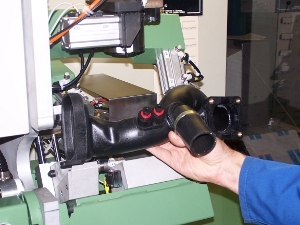 When the camera is replaced, the duct is verified as intact by applying a heated mark. Assembled and leak tested blow moulded turbo charger duct. 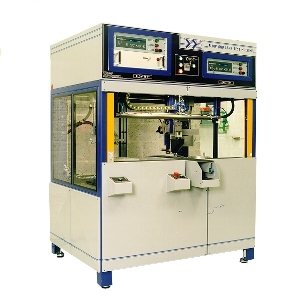 Fully automatic and secure oil filter assembly leak and flow test machine. The left hand station conducts a flow test: each filter has several inlet and outlet ports that are closed off and flow tested. The filter is then transferred by pick and place to a bell jar leak test system in the right hand station. After testing, the filter is picked up again and transferred to the central point to be ink-jet printed as passed and deposited on the central outfeed conveyor. If a filter failed the test, it is dropped into a secure reject bin.